Home » Fiction/Science Fiction/Fantasy » Rejection–Oh, the humanity. While editing the first draft of my novel, I thought I’d try to sell a stand-alone portion of an early chapter. I edited the story, about 3,800 words in length, and submitted it to a sci-fi-fantasy magazine I read and thought would be appropriate. It was my first attempt at submitting my work and was done electronically. After a couple of weeks, I received a reply–my first rejection. Well, the first rejection of something I’d written and tried to sell. How dare the editor reject my perfect prose–of course, I’d already re-written some of it during those two weeks, just in case I’d have to try to sell it to someone else and to make it fit better in the novel. In full the note from the editor read: Thank you for letting me read “Impossible Answer.” There’s some good writing here but overall the story just didn’t grab me so I’m going to pass on it. I wish you best of luck finding the right market for it, and I hope to see more stories from you in the future. As disappointed and heartbroken as I was, I sent the story, the revised version, off to another sci-fi-fantasy magazine via electronic submission that afternoon. I’m keeping my fingers crossed, but I’m not holding my breath. At this particular instant in time, I’m quite happy that I’m retired with a good pension and rejection doesn’t mean I don’t eat this week. I am currently “working” on editing the novel, plotting a sequel and writing a novella/novel based on an idea of my wife’s. 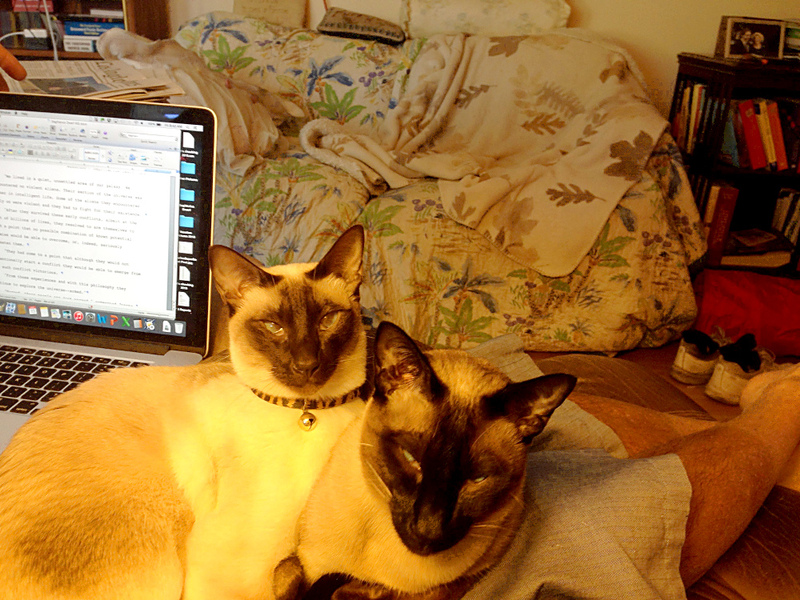 The cats, Mist and Smoke, are not, however, always supportive of my work habits. 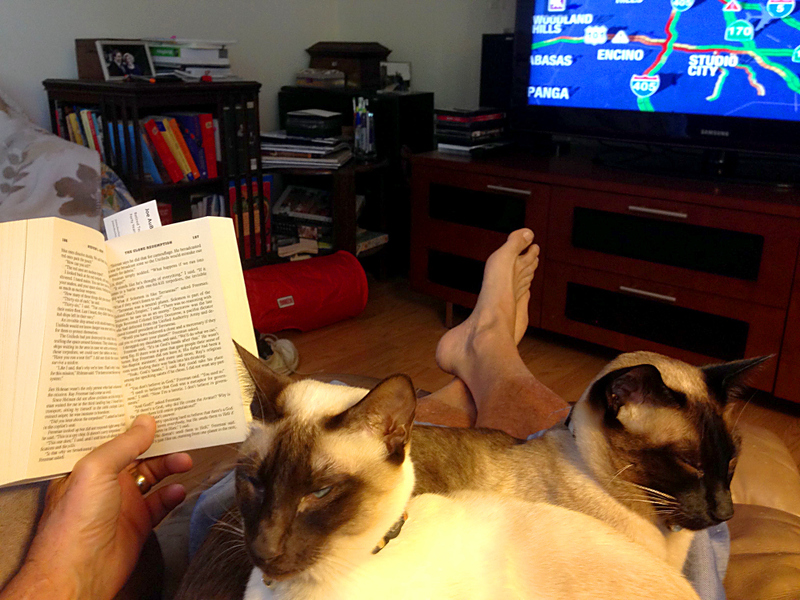 Reading is OK, but we still get the lap.